Written and Directed by Aaron Katz. 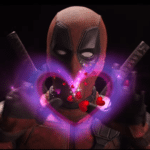 Starring Lola Kirke, Zoe Kravitz, John Cho, Greta Lee, Nelson Franklin, Michelle Forbes, Ricki Lake, Reeve Carney, James Ransone, Jessica Parker Kennedy, Todd Louiso, Marianne Randon, and Gabriela Flores. Those considering a career as an assistant to Hollywood actors may end up rethinking their ambitions after watching Gemini, a noir thriller drenched in neon colors and sharp hypnotic direction from Aaron Katz (also pulling double duty writing the script) and cold themes regarding celebrity sycophancy and friendship. 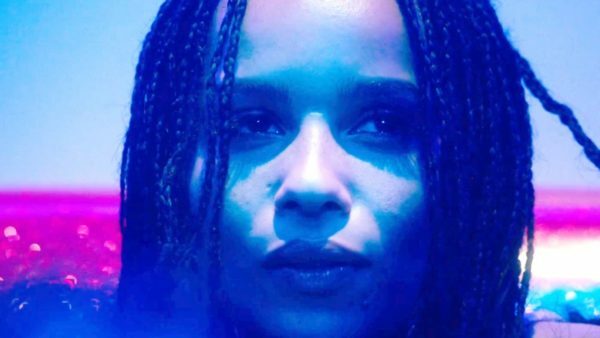 Like any good mystery, the film establishes a mood from the beginning that creates an air of ambiguity around the motives of its central characters; Hollywood actress Heather Anderson (Zoe Kravitz) appears to be going through a cynical rough patch within the industry, pulling out from a project already in motion, which naturally is a decision that upsets many others around her whether they be business associates or personal friends. 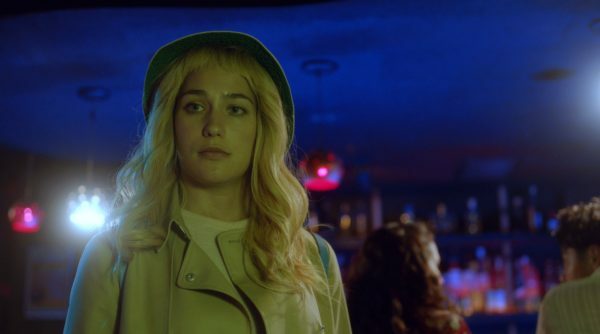 Not to dive too far into spoiler territory, but after a fun night out on the town with her assistant Jill (Lola Kirke, who really is the propulsive force behind why the transfixing piece works so well, as she’s looking to clear her name by avoiding detectives and sleuthing around like a novice investigating key suspects but with a clear sense of danger that due to her nonexistent speaking experience she could get caught at any minute and make the situation even worse on herself), Heather is found brutally murdered inside of her ritzy celebrity appropriate household (a striking abode featuring different color patterns in every room, along with light photography capturing large and lengthy sets of entranceway stairs among other eye-catching images) with five bullet hole wounds. Shortly following the findings of the tragic incident, John Cho shows up as a reserved and quiet detective named Edward, a pushy fellow pressing Jill with an endless amount of questions as she is the prime suspect. The reasoning behind this is a little contrived; Heather was feeling unsafe the night of her murder due to angry associates and a rather unsettling encounter with a super fan far too invested in her personal life and also making inappropriate inquiries, and decided to ask Jill if she could hold on to her pistol. Being the good friend and caring business partner she is, Jill naturally obliges, but not before accidentally firing the gun off at a chandelier before leaving. Call it a satirical play on the dangers of inexperienced gun users with a firearm if you want, but more than anything it feels like a manufactured element to further paint Jill as the most prioritized suspect by getting her fingers on the murder weapon along with conflict inside of the household. Thankfully, when Gemini is following Jill around as she hits up everyone from friends to industry associates to possible lovers, there is an immersive quality to the proceedings as Aaron Katz takes his time filming such scenes. Also, he doesn’t just utilize tracking shots but is also always looking for interesting places to put his camera and give audiences unique perspectives, such as just outside of a bathroom doorway with the mirror reflection being used to show us a character. Some of the more complex shots involve Jill evading the authorities, but all in all, there is rarely a dull moment from a filmmaking standpoint. It also helps that there are a lot of suspects to consider throughout the film, even if most of them end up underdeveloped. The problem is that the resolution to this whole mess is ineffective with its message and uses the silliest possible outcome. At the midway point of Gemini is a scene where Jill and another Hollywood personality go over all the different possibilities as if the movie these characters are populating is actually real life. Aside from being one of the only missteps in the script, Gemini takes the most ridiculous of those options and rolls with it, falling rather flat and ending on a dry note. 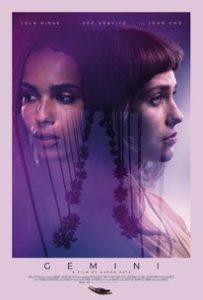 Still, Gemini is competently crafted, finely acted (Kirke, Kravitz, and Cho all nail their characters with Zoe giving the Hollywood starlet depth despite minimal screen time) and clear-cut answers to all questions in a tight 90 minutes that admittedly does captivate more than it does frustrate.